The South African court that is deciding on the ownership of a detained phosphate rock shipment from occupied Western Sahara, has set a date for its judgment. On 18 May, a hearing took place in the High Court in Port Elizabeth, South Africa, to question the parties in the case of a disputed and detained phosphate rock shipment. The judges concluded that the court will pronounce its conclusion on 9 June. This means that the detention of the cargo on board the bulk vessel NM Cherry Blossom would last in total 40 days, from when the vessel first entered the harbour of Port Elizabeth in order to bunker on 1 May. Morocco had tried to export a cargo of phosphate rock from the territory it holds under illegal occupation to a farmer owned cooperative in New Zealand. However, the representative body of the people of Western Sahara, Polisario, wanted it otherwise. The importer in New Zealand, Ballance Agri-Nutrients, had stated to New Zealand media that it does nothing wrong, as it claims that purchases from the Moroccan government benefit Western Sahara. Such argument was rejected by the Court of Justice of the EU as irrelevant (§ 105-106) in a 21 December 2016 judgement, and found insufficient by a key UN legal opinion in 2002. The owners of the phosphates, the people of Western Sahara, deny that they benefit, and has asked the exports to stop. Half the Saharawi people live as refugees. The question for the South African court, then, is who owns the cargo on board. Morocco has alleged that it has the right to export the non-renewable minerals from the Bou Craa mine, despite no state in the world, nor the United Nations, recognise the Moroccan claims to the land. Ballance had not asked the court for an interim release of the vessel, hoping the issue would be resolved by the court in this first round. Ballance has never answered questions as to whether they had obtained permission from the owners of the phosphate rock to import. Western Sahara Resource Watch has for the last five years daily monitored the shipments of vessels leaving the territory of Western Sahara. During those years, it has never happened that a New Zealand bound vessel stops to bunker in South Africa. On the other hand, the New Zealand destined shipments always travel westwards through the Panama Canal or around the Cape Horn, crossing the Pacific Ocean.. Since yesterday, the Panama route has become more challenging for the importers in New Zealand and on the Canadian west coast. A second bulk vessel was detained on 17 May 2017 in Panama, on the way from Western Sahara to Canada. A judgment from the Court of Justice of the EU established clearly a principle which the UN Human Rights Council had already addressed: that business activity in Western Sahara requires the consent of the representative body of the people of the territory. The Canadian importer Agrium confirmed to The Canadian Press on 18 May that the second vessel detained was for them. On 25 April, WSRW published its latest annual report outlining the phosphate trade from the territory. 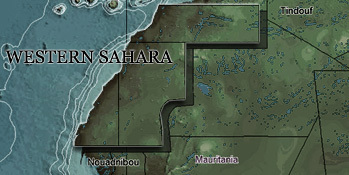 A part of Western Sahara, including the phosphate mine, has been under Moroccan occupation since 1975.